Security is the most important factor in today’s online world. It is absolutely important to have a security solution on a computer that can protect the data from viruses and malware. There are free antivirus programs like Avira Antivir, Avast Antivirus Free and AVG Antivirus Free which solve this problem. If you can’t afford a premium security suite, you should always install a free antivirus solution. The free antivirus contains almost all the features that a normal home user needs. AVG is the most popular free antivirus. It was not my preferred choice because it had become very heavy on system resources and the detection levels were far less than the other free choices. But AVG free edition has improved a lot in the last two years or so. 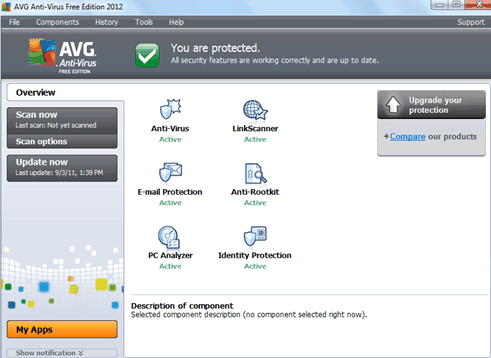 The new edition of AVG Antivirus Free is AVG Antivirus 2012. Infact AVG has released a 2012 version of all their products. The most important improvement in the new edition of AVG is the detection rate and the performance. It no longer seems to be a resource hog. The most notable new feature in AVG Antivirus 2012 Free Edition is AVG Accelerator. It optimizes the downloading and browsing speed of the Internet. Another improvement is the addition of AVG Adviser. The adviser will give suggestions to improve the system performance in real time.